Since August over 420,000 Rohingya have fled Myanmar, citing human rights abuses and seeking temporary refuge in Bangladesh. In part one we looked at the background and context of the Rohingya crisis. In this second part of Sarah Seniuk’s and Abby Kulisz’s interview with Michael Jerryson, they look at the role of Buddhist nationalism and the impact of Islamophobia in the developing crisis. Sarah: How do you see the relationship between the Burmese government and the military affecting the continuation of violence against the Rohingya? Michael: That’s an important question not just for Myanmar, but for Southeast Asia as well. We are seeing countries turning more towards an authoritarian government throughout Southeast Asia. For example, there have been outcries about Cambodia’s treatment and jailing of opposition leaders. In Thailand, the junta has been in control since May 2014. In Myanmar, there has been a long history of the military being in control. It appears right now that the military and the civilian government are working in unison, reinforcing one another. The recent past is pertinent to this question. When the junta was in charge of the country, they would jail people who were too outspoken on Buddhist nationalism. They jailed U Wirathu, who is a very vocal member of another Buddhist nationalist group called the 969 movement. The term “969” is shorthand for the Triple Jewel in Buddhism: the 9 traits of the Buddha, 6 traits of the Dharma, and 9 traits of the Sangha. U Wirathu is a very high level Buddhist monk who was jailed because of his political pressure to make the government more focused on Buddhist nationalism and against Muslims. He was released in 2013 along with others, and the democratic arena has allowed him and others to flourish in their populism. Whereas the junta was oppressive overall and silenced forms of Buddhist nationalism, the democratic civilian government has provided room for Buddhist nationalists to grow and develop. In no way is the civilian government and military doing this by themselves. They are being supported by a large swath of Burmese Buddhists. 88% of the country is Buddhist and almost 70% are considered ethnically Burman, compared to a little more than 4% of the population that is Muslim. Buddhist nationalist organizations like the 969 movement and the Ma Ba Tha have galvanized and furthered this Buddhist populist movement. And the military is acquiescing and supporting the use of violence. Abby: The UN recently called the situation a textbook example of ethnic cleansing. How does Buddhism relate to the violence? Is there a separation between the government and religion? Michael: Southeast Asia governments argue they are secular. However, whether it is in Sri Lanka, Thailand, or Myanmar, there is clear evidence of preferential treatment towards Buddhists and supporting Buddhism. In the Constitution of the Republic of the Union of Myanmar, Section 361, it states “The Union recognizes special position of Buddhism as the faith professed by the great majority of the citizens of the Union.” This and other examples display a secular persuasion that is very Buddhist. Abby: How do Buddhist nationalist groups view themselves and their goals? Michael: The members of the 969 movement and the Ma Ba Tha feel it is important to protect the nation from “Islamization”. The way they imagine the nation, à la Benedict Anderson, is to see it as Buddhist. U Wirathu of the 969 movement has given sermons in which he begins with statements such as, “These days, whatever you do, you need to do it from a nationalist perspective. Our existence as a Burmese Buddhist nation has been threatened.” You see Buddhist monks from the 969 movement and Ma Ba Tha pushing forward policy ideas and laws, like the four laws previously mentioned, as well as defending the laws. The 969 movement as well as the Ma Ba Tha would self-identify as Buddhist nationalists in what they are trying to do. Sarah: This is more an observation. As you noted earlier, most recently reports point to the displacement of over 400,000 Rohingya. And nearby in India, there is a similar-sounding growth of Hindu nationalism as well. Thus, the UN has expressed concern not only about the Rohingya in Myanmar, but the international refugee population as they may again face a nationalistic type of persecution. Michael: Yes, and I think this is where it shows the vulnerability of the Rohingya. The Burmese government’s allegations have been that Rohingya are simply migrants who came across the Bangladeshi borders in recent years. They are visitors; they are not citizens. And the Burmese government argues that the term “Rohingya” is made up. Now, on one hand, they are partly right. The term “Rohingya” is a modern nomenclature. But on the other hand, they are absolutely incorrect about the history of Rohingya in Myanmar. We have documentation of Rohingya in Myanmar for over 150 years. Burmese Buddhist nationalists have also expressed concern that Muslims are overtaking Myanmar. While the Rakhine state had changed in its religious and ethnic demographics over the last several decades, we have not seen a change in Myanmar’s country-wide Buddhist-Muslim percentages in over three decades. It has remained relatively stable. Recently, the Rohingya have found their way into Bangladesh, but this is a new phenomenon. Over the last several years, Rohingya have tried to flee Myanmar, but no country has provided resources to receive them. One powerful example of this is the smuggler’s ring discovered in 2015. Rohingya had been paying smugglers to take them away from Myanmar. Some smugglers would not bring them to their ultimate destinations. Instead, they would stop in remote areas of southern Thailand. The smugglers would then demand a ransom. If the smugglers were not paid, the smugglers would kill the Rohingya. A joint military task force found these mass graves of these Rohingya, who had been killed by these smugglers. This shows again the challenges of the Rohingya. Where can they go? Bangladesh was not hospitable to these individuals before, and with 400,000 refugees, their hospitality is stretched thin at present. Featured image credit: Photo of Kutupalong Refugee Camp in Bangladesh by John Owens (VOA). Public domain via Wikimedia Commons. Michael Jerryson is an associate professor of religious studies at Youngstown State University. Since 2004, he has lived and worked in Buddhist-Muslim conflict zones throughout Southeast Asia. 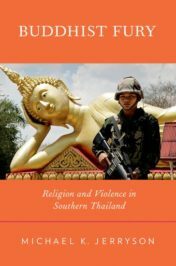 Among his publications, he is co-editor of Buddhist Warfare, author of Buddhist Fury: Religion and Violence in southern Thailand (2011) and his forthcoming book If You Meet the Buddha on the Road: Buddhism, Politics, and Violence. Sarah Seniuk has her Masters in Ethics, Peace, and Global Affairs from American University. Her work focuses on the re-imagining of human rights frameworks, and problematizing identities surrounding violence. She currently does communications work for the Arab American Institute in Washington, DC. Abby Kulisz is a PhD student at Indiana University in the Department of Religious Studies. Her research focuses on pre-modern religions with an emphasis on textual representations of gender, violence, and identity. She is currently working on a project about the affective dimensions of early Christian and Islamic sources.